Puljujarvi would be 8 but he's not attending. They also have two eligible Russians but not sure where to find info on Russia's summer camp roster....if they even do a summer camp. I really don't think world juniors invites matter much though. Every NHL team has a bunch I'm sure because they take the best kids from each country at the draft every year. Treliving in his bit with Kerr on Fan 960 on Friday afternoon was talking about the strong leadership qualities they see in Valimaki - it was one of the things that attracted the Flames to him. Well that didn't go the way you thoughtit would. It's impossible not to make fun of them !! The Finns played another game against the Czech's yesterday, but Eetu and Juuso did not play. The good news is the Finland announced they cut the roster down and both Tuulola and Valimaki will be going to Plymouth to play against the Canadians, Americans, and Swedes in the Summer Showcase. How many of them have an actual shot at making the team? On Team Canada you have Skinner and Wells in goal. Cart Hart is returning and I would say DiPietro has the inside track, so neither of the Oilers prospects make the cut. You have Tyler Benson up front, but he's coming off another shortened season and is fighting against much better players. On Team Canada, I would say that without major politicking by Nicholson or Lowe, zero Oilers prospects make this team. On Team USA you have Kailer Yamamoto and Phil Kemp. I would say Yamamoto is a virtual lock. Kemp doesn't stand a chance on defense. 1 Oiler prospect makes the team. 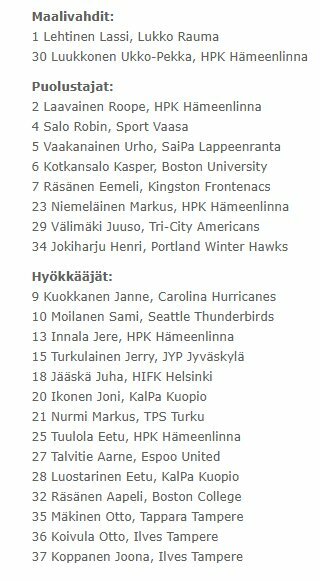 On Team Finland it appears that Aapeli Rasanen has a pretty good shot at making the squad as he's on the short list going to North America for the pre-tournament series. I would say you'll see 1 Oiler prospect on the squad. The Russians and Czechs are complete unknowns right now. Seems they both have a big number of returning players, so opportunities for freshly drafted players may be limited. I would say the Russians may have a better chance than the Safin. So in reality you have potentially 2-4 players with a realistic chance of making their respective teams, with two being a lock, and two more being outside possibilities, just because of the lack of information. So two out of "nine" so far. Will these games be televised? Its actually ten. I missed Kemp for team USA the first time around. Wonder why Ruzicka didn't garner a nod? Originally Posted by Rick M.
They however won't be showing the games from July 28th to August 2nd, but most of those involve split squad games for the Canadians and Americans. Finland playing USA White today. Lines and yes Valimaki still wearing the C.
Also sort of interesting is Valimaki is listed as playing on the right side. Last edited by sureLoss; 07-29-2017 at 10:21 AM. I think it was brought up in another thread; the Slovakian U20 team is typically a group of domestic (playing in Czech/Slovak leagues) players, which is usually complemented by North American players closer to the WJC tournament. Finland lost 4-2 to USA White. Juuso Valimaki (CGY) having a very good week against CZE and USA u20 squads. Great two-way play by the first round defenseman. If Valimaki has a strong camp with the Flames, it wouldn't surprise me to see him get at least a few games on the 3rd d pairing with Stone. I don't expect the Flames to keep him up permanently, but giving him a taste of the NHL without burning a year on his ELC may just be the thing to do. I expect Flames fans will quickly grow to like this kid the more they see him. I'd be stunned if he makes first cut. There is 0 expectation for him to play this year. His appearance at main camp is purely courtesy. I don't think he gets a sniff this year. The Flames aren't going to keep a kid they plan on returning to junior and expose other players to waivers that could play this seasons as a result. Valimaki could turn into an important piece down line, but they aren't going to push him into the lineup without reason. Treliving is smarter than that. Expectations are low for Valimaki, but there is a reasonable chance IMO that he could show enough at camp to be in the mix for a spot. Gulutzan's preference to have left shots play the left side and right shots play the right side, likely takes Andersson out of the running for 6th D. Being waiver exempt probably takes Andersson out of the running for 7th D. He is likely the first call up if one of Hamilton, Hamonic, or Stone get injured. Healey probably needs at least one season pro before he is even in consideration for a call up. On paper, Valimaki needs to show he is better than Kulak, Wotherspoon, Bartkowski, and Kylington. The first 2 have yet to establish themselves as everyday NHLers. Bartkowski didn't have a NHL contract until just before the trade deadline. Kylington still has work to do on some of the brain farts and the defensive side of the game. The Flames already exposed Wotherspoon to waivers last year, don't think they will be too concerned about losing Bartkowski to waivers. I think in the end it is unlikely Valimaki makes the team. But given the Flames current situation, he certainly could be in the mix at camp and it wouldn't surprise me. Being able to hang with Kulak, Bartkowski, and Wotherspoon isn't impossible for him. Last edited by sureLoss; 07-30-2017 at 08:16 AM.